Published by NightBallet Press in June of 2017. Available online from Amazon and NightBallet Press. 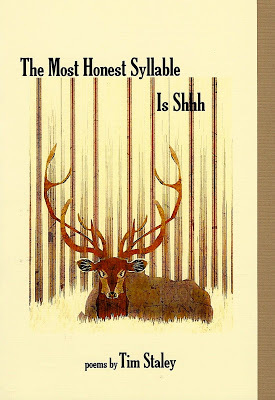 The Most Honest Syllable Is Shhh is saddle-stapled, printed on textured ivory cardstock, with a warm, light-coffee cardstock insert. The text is printed on ivory paper. It contains thirty-two pages of twenty-three poems. Who else would hand you dreadlocks, a harmonica, and an underspiced tostada? Tim Staley’s gift for playful juxtaposition is on joyful display in The Most Honest Syllable is Shhh. In one collection, he throws you a giant squid, a barfing beagle, and someone named Mud Shark. A beer, a blowtorch, and an insult to opera’s pants. A musical toddler, the Rio Grande, and the Lady of Shalott. A Dionysus of combinatorial whimsy, Staley drops zen koans into camping stories, and investigates deep divides of gender and class alongside a parent and high school teacher’s daily dilemmas. His poems are as likely to consider the cosmic—does space smell like searing meat, pine trees, or cherries?—as the domestic: “Certainly I rinsed the vegetables,” he assures you, and you know not to believe him. In these pieces, the oldest poetic impulses to praise and mourn and cry out meet and marry the off-kilter collage and the party anecdote. Staley is as likely to consider the egg yolk stuck to a child’s face as how to paint a city skyline. As likely to describe his BO as how “the Sea of Tranquility / holds that last gist of light / in its darkest hour.” By turns sincere and zany, whimsical and cynical, or somehow, through his kaleidoscopic layering of vocal tones, all of the above at once, these poems invite you to kick off your flip-flops and relax around the campfire with your new, tender-hearted, wacky and wise friend, Tim Staley. Published by Pski’s Porch in April of 2016. Available online at Amazon.com and Barnes & Noble. Available in Las Cruces, New Mexico, at Art Obscura and Coas’s Books on Main Street. Review of LOST ON MY OWN STREET on Cacti Fur. Tim’s poems use lively language, even when they are narrating actual life experiences. His poetry is imaginative and funny even though he often deals with serious concerns. But even when dealing, for example, with the hospitalization of his young daughter, he might do so in an ironic or self-mocking manner that helps deflate any potential sentimentality. This mixed tone is what makes Tim’s poems so interesting, I think. See what you think. Tim’s delivery was infallible — full, humorous, serious, some from memory some not, and his new book “Lost On My Own Street” is a winner. Probably the best energetic reading performance I’ve heard in a long while!